Josh Colle introducing a motion to reverse budget cuts at City Hall this morning. 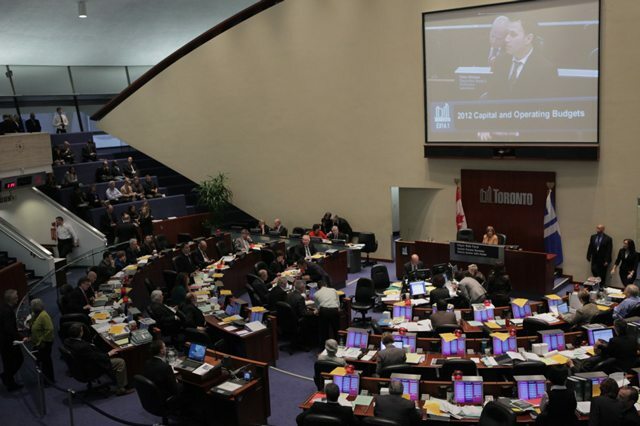 In a stunning loss for Mayor Rob Ford and his allies, in one day of debate councillors have reversed a significant raft of cuts he was pushing to include in the 2012 budget. Among them: closures of shelters, daycare spaces, and pools; cuts to community grants (to fund things like HIV-prevention services); a major cut to the library system; and a major cut to the TTC. Not all of those cuts were reversed: the library is still scaling back on staff and collections, and perhaps most prominently the TTC will still need to reduce service on three dozen bus routes, but the full force of the original draft budget has been substantially blunted. Streetcars are the enemy. Ford and his allies are trying very hard to make streetcar funding the lynchpin of this debate. We can’t afford to reverse any of these other proposed cuts, they keep saying, because council (under Miller is implied though not always said aloud) pushed through a $700 million streetcar purchase that we don’t know how to pay for. By focusing on the streetcars—which Ford didn’t want to buy in the first place— throughout today’s debate they were trying to paint left-leaning councillors who supported the streetcar purchase into a corner. “You want those streetcars? This is how we have to pay for them.” This tactic, as it turns out, failed completely. (Possibly because many councillors maintain that most large infrastructure purchases are paid for through debt and that this is an appropriate financing tool—though nobody on council’s right is prepared to consider that among the menu of funding options.) Even so, expect this line of argument to be repeated often, both as a caution against anyone who suggests any more infrastructure spending and in framing future budget debates. Josh Colle comes out from hiding, and stakes a position against Ford. As we wrote earlier today, in many ways this debate was Colle’s coming out party. The councillor has been flying under the radar since his election, voting as a centrist (with Ford a little over 40 per cent of the time) and keeping quiet when it came to most major debates. Having shepherded the Lawrence Heights revitalization project through a major council vote in November, he now seems more comfortable opposing the mayor. Today, in a move that was unprecedented for him, he moved a major raft of changes to the budget, the effect of which was to reverse many of Ford’s proposed cuts. He put himself directly in the firing line—his motion was the subject of much of the debate today—and he’ll be a new force on council in virtue of his willingness to do so. The question now is what’s next for Ford? Ford staked his mayoralty—though not his campaign for election—on his bid to shrink the size of government, to reduce the scope of what we think City Hall ought to be doing. That bid has just suffered a major blow. Tomorrow’s story will be how he spins the vote—and, crucially, how this affects the momentum that’s been building towards a lockout of City workers. See our liveblog of the full day’s debate.